My quilt, "Pi E2 [Exponentially Embellished]," returned from the 2014 HMQS [Home Machine Quilting Show]. This is what I saw upon opening the box. "Pi" returns from the Salt Lake HMQS. The ribbon comes protected in a clear cellophane sleeve. The certificate was in the envelope with a cash award. 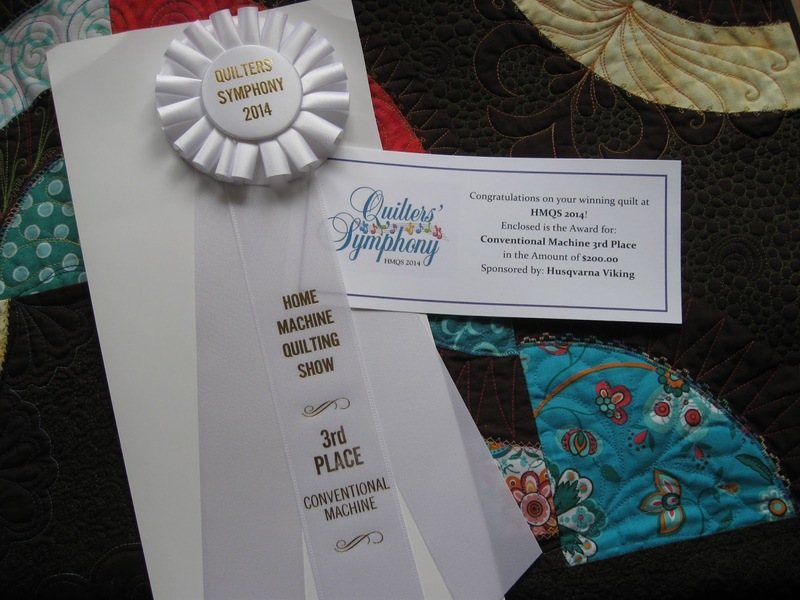 Third Place ribbon and certificate in the Conventional Machine category. 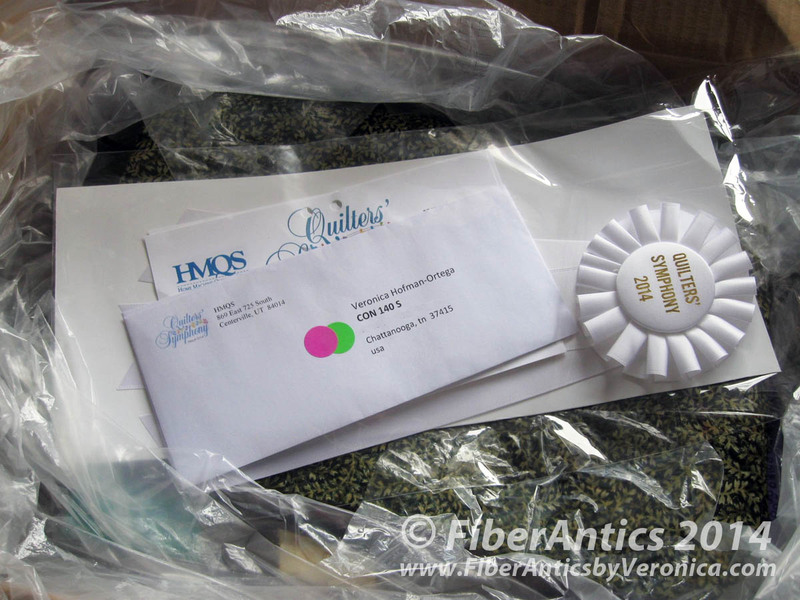 This was my first entry into a Machine Quilting show and it was a real honor winning a ribbon! [Story here.] One of the best parts about this experience was that I got to share the good news with my quilting friends. First, at the Chattanooga Modern Quilt Guild when my friend, Karen, announced the news to the group. Then, at the Choo Choo Quilters Guild during Show and Tell. Both guilds gave me a round of applause. 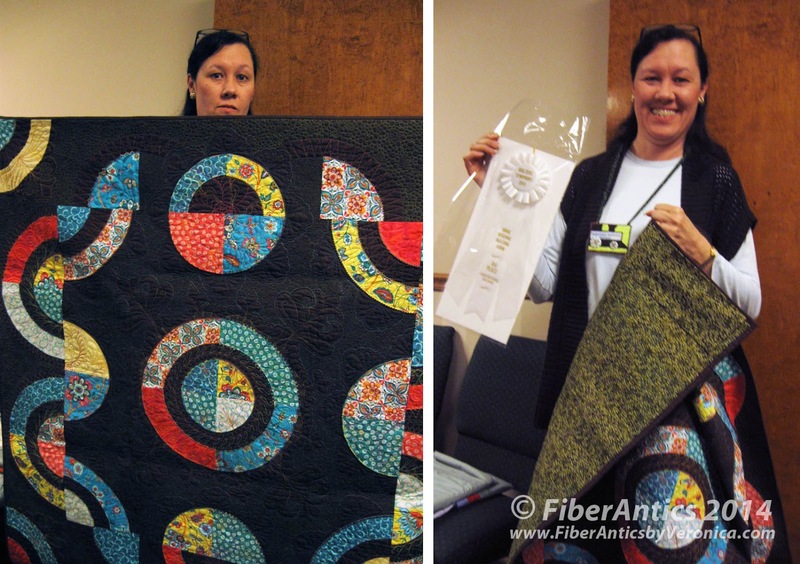 Show and Tell at the Choo Choo Quilters guild meeting. If you are quilter and don't belong to a quilt guild, find one and join! There is nothing like having your friends—who understand what you do and why you do it!—support you and be happy for you and with you when something amazing like this happens. If you don't think you could ever put your work in a show (for whatever reason) or that your work could ever win something, I would tell you, "you don't know unless you try." Just do it! This quilt started off as just a sample quilt top to showcase Sisley, a fabric collection by Blank Quilting. It traveled with me for over six months before it ever got quilted. Then it did. The quilt stats are here. And this is height to which it has flown. It will accompany me often to my Intro to Free-Motion Quilting classes to serve as inspiration to my students and fellow quilters.